It's hot right now. Humid. Muggy. Sticky. Sweaty. My current routine has 2.5 steps, because I can't stand moving around a lot while I cleanse, and forget product multi layering. I haven't posted a summer routine this year, because there's been very little routine to post. I've been using a cleanser, a BHA exfoliant, and sometimes when I'm extra motivated, a chilled sheet mask. Essences, serums, hydrating toners, rich sheet masks, creams, oils? Urgh, I'm feeling slimy just thinking about them, yet that's exactly what I'm doing - thinking ahead. Even though it's still 80+ degrees with ultra-high humidity that leaves me waking in a puddle of my own sweat, I've been plotting and planning my autumn season skincare routine. The only sign of the coming colder weather is shorter days and rapidly fading light. Planning ahead allows me to leisurely research and contemplate what products I might like to try, figure out where they would go in my testing schedule, comparison shop, and mull over the contents of my cart. I'm big on mindfulness when it comes to beauty, and this is the equivalent of shopping while you're full, instead of waiting until you're hungry and just want all the things. I have no idea how many of these are going to work out, but it feels good to have some new product testing on the horizon, instead of endless repeats of the same minimalist routine. Bring on the cold weather, I am beyond ready! Hard to believe, but I don't think this is just a marketing scheme. 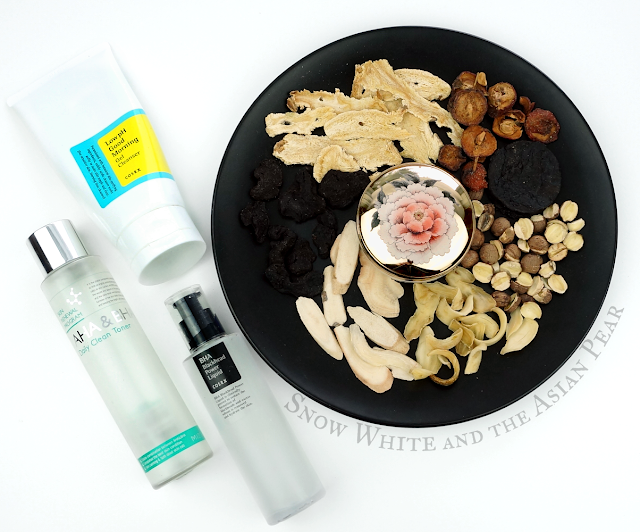 In K-Beauty & Portion Control: Why Sometimes Good Value Can Be a Bad Idea, I talked about the concept of 'seasonal skincare', where one changes their routine to match how their skin needs change with the seasons. Granted, that's only applicable if you live somewhere with distinct seasons, but I moved from a "10 months of summer" desert location to the American midwest (correction: Dr. Mr. the Pear advises me that Midwest is supposed to be capitalized) and the seasons are .... distinct. That makes a seasonal skincare approach a must, because while my dehydrated, combination-oily skin might be very thirsty in the winter and enjoy some atypical delicacies like sleeping packs and facial oils, the humidity and heat of summer has my pores producing more hydration and oil than I can tolerate already. Thankfully, it's easier to go from summer to fall than from winter to spring; you can always add richness to existing products but one can apply heavy products so thinly, eh? Sort of like layering clothes to cope with temperature-- you can always put on more socks and sweaters, but you can only get so naked ... ? For the colder months, I like to focus on many, many hydrating layers, with light-to-medium creams that can be boosted with a few drops of facial oils. I also step up my actives once the sun weakens + my skin can tolerate more layers to balance out the stripping effect of the actives. I dropped everything that was photosensitizing from my routine for the summer, but I'm planning to work those back in and step up my layering game to compensate. For the heavier items, like emulsions, creams, facial oils, and sleeping packs, I'm going to be looking for 'light' versions. I can always add more layers, but if something is too heavy, I won't end up using it. I've got a few of these already ready to be tested, so here's a peek at some of the things I've got in my testing queue! My thirst for interesting low pH cleansers is unslakeable. Edit: This cleanser is misleading; despite having a giant "5.5" on the label like the pH 5.5 toner does, it's actually quite high in pH and I double checked with two types of strips just to be sure. See this Instagram post for more details. Hmph! Pray for my pores, I'm trying another oil cleanser. I'm almost done isolation testing this product, actually! I've also been using this for a few weeks. The dropper is inside; this will be stored in my fridge until I am ready to use it. Fading hyperpigmentation without photosensitizing, aw yeah! This is next on my testing schedule. This glass jar has a beautiful frosted/etched flower that doesn't show up in this photo. Xai Cosmetics Korea Bo-in High-Moisturizing Jeong-Yoon Balancing Cream - This was the bonus cream that came with the matching emulsion that I got at the end of spring, which was terrible timing as even the emulsion proved too heavy for the swiftly-warming season. I have several backups of the sort-of-discontinued HG Beauty of Joseon cream, so I'm going to be cautiously testing potential replacements. I already have this on hand, so it's the first cream I'm going to check out. Where to get it: No idea, this was purchased in a brick & mortar store via a buying service. Mmm, this smells so good. I definitely want to explore Taiwanese and Japanese masks more, after the recent concerns raised about ethically manufactured Korean sheet masks. For many reasons (including avoidable waste and sustainable wages) I'm seeking out machine-processed masks right now, and both Taiwan and Japan have automated manufacturing processes so I can mask without guilt. I've been living off a steady mask diet of LoveMore and My Scheming masks lately, and I'd like to pick up some richer-textured masks. My favourite silk mask is still the LoveMore Pearl Barley & Milk, which has the fantastic silk mask fit + a thin, but milky essence that has a bit more richness than the ultra-thin essence in most of their masks. You can find them on: Amazon | eBay | Beautibi | BonjourHK. I definitely want to find other ultra hydrating/milky/creamy-type Taiwanese masks, and I'd like to check out Japanese masks more. I've tried a few, but their fit wasn't great. That just means I need to try more varieties, right? This is long since empty, but it's such a pretty package and a decent mist bottle that I'm going to repurpose it. This tube is getting dangerously empty. That's my plans for now, at least until my skin flips out while I'm testing something or something arrives and sweeps me away in a whirlwind romance. I've also got some cleansers coming in a buying service order, so we shall see what comes of the line-up once they arrive. Do you have a physical-filter sunscreen that's neither greasy nor drying, and sits well under makeup? Hit me up on Facebook or Twitter and let me know! **Disclaimer: All products featured in this post were purchased by me, or were a personal gift from my exfoliant fairy Tracy. This blog contains both affiliate and non-affiliate links, and clicking the former before you shop means that this blog may receive a small commission to assist in this blog supporting itself. Please see my Contact Info & Disclaimer policy for more information. I love your thought process behind how to adapt your skincare and what you want to try. I am interested in you elaborating on what your concerns are regarding Paula's Choice if you would be able to share. You know there's Paulas choice tinted sunscreen which is expensive that Ratzilla recommends and its pa +++ and its zinc that's 14% if I remember correctly . Physical sunscreens definitely have their downsides, though! The first Kbeauty purchase of mine includes one of the reformulated sunscreen of Innisfree, the Daily UV protection no sebum SPF 35 which is 100% mineral filter. Sadly I can't like it even though I really want to: it has a quite strong scent and it leaves a super visible white cast. The same for Missha Sebum Zero SPF 50. I am looking into purely physical sunscreen options as well, particularly cosmetically elegant ones, and I read a positive expert review of the First Aid Beauty Ultra Repair Pure Mineral Sunscreen Moisturizer Broad Spectrum SPF 40 (whew, these names). It's however, more expensive than your current one (by 10$) but, thought I'd leave the suggestion just in case it could be of help to you. In regards to the PC sunscreen that someone else mentioned, I have read that unfortunately it is not appropriate for us pale ladies ): as it has a yellowy-orange tint...maybe reviewers were exaggerating, but I would be wary. Other than that, I have read that it's a wonderful sunscreen. I really love your blog, not only your useful posts but your writing style, it is always a treat to read your entries. Awww, thank you for the kind words, and for the product recommendation and warning! Considering my ongoing issue with things going orange on me, that PC sunscreen sounds like a hard pass. I have a fairly "healthy" skin which rarely breakouts, and I'm living in the same weather with you (which is freaking hot and humid). I'm about to work full time in a very toxic workplace (lab + hospital + nail salon). Just 2 days "trying time" and I have 3 pimples around my brows already. Do you have any recommended routine for my situation? Thanksssssss so much!!! Definitely agree with you about the black masks from My Scheming, picked up a bunch in Taiwan this summer and they are great. For Taiwanese masks, you might contemplate the Dr. Morita line if you haven't already. I bought several boxes of their stuff on the same trip, and while I don't find the essence to be "thick/creamy," I do find it very moisturizing and the masks don't dry out fast. The morning after, my skin feels really plump/bouncy/QQ! Thanks for the tip about Dr. Morita! I definitely want to try more Taiwanese masks. Have you been looking for whitening type masks specifically? In my experience they tend to have anti-inflammatory ingredients which help to temporarily reduce redness. Yess, I'm also planning (well, already bought a lot of products from my list lol) my fall/winter skincare. I honestly really like planning it out, researching products and all that comes with it. Ooh, I'll keep an eye out for whitening masks. At that point I was just in "OMG CHEAP MASKS EVERYWHERE BUY ALL THE THINGS" mode so I just... bought all the things. Luckily I have friends still in Taiwan who have already volunteered to send me care packages of masks as long as I can send them pictures of what I want! This friend is a good friend. Keep this friend, and love them always. They want Reese's Peanut Butter Cups in exchange. I call this fair. Especially since Taiwan lets you ship things overseas by ground (sea) and the US doesn't, so I have to pay way more just to get things to them. Has the beauty of joseon cream been discontinued? La Roche-Posay Anthelios 50 Mineral Ultra Light Sunscreen Fluid, it comes in an untinted version and a tinted one (which I have not tried),it's a very thin, milky fluid. It doesn't have a strong cast, but it doesn't layer amazingly, either. The coverage is very good, though.